A beautiful black and white Akita found herself at Maricopa County Animal Care and Control. She was painfully thin at only 43 pounds and could barely walk. Her hips showed through her skin and she had a large mass on one of her legs. She was a very sick girl. Akita Advocates came to her rescue and reached out to PACC 911’s Lulu’s Angel Fund who gladly provided assistance for her medical costs. She was saved! This poor girl had to be carried to her freedom ride, but her spirits started to lift as she was reassured with soft, gentle voices. She felt safe and secure in her rescuer’s arms. She was given the name Aki, meaning Autumn in Japanese. Aki was taken to the vet right away for a full check-up, bloodwork and x-rays. It was determined that she had untreated Valley Fever that had caused severe deterioration in her hip making it difficult and painful to walk. 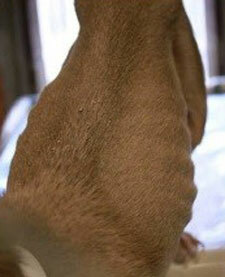 Her illness was causing her emaciated state as well. Aki began treatment for the Valley Fever immediately and the condition of her hip would be monitored. Just 6 weeks later, Aki increased to 57 pounds. She is a long lean girl and feeling so much better. 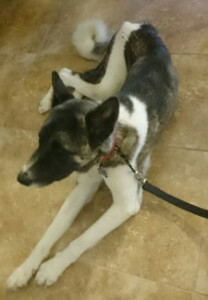 She has moved in with her foster family and gets along great with her new Akita sibling Clarence. In fact, she just might be staying forever! 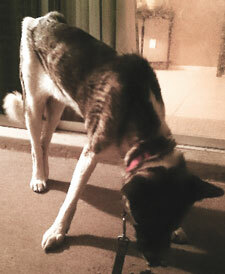 Thanks to Akita Advocates and PACC 911’s Lulu’s Angel fund, Aki gets a second chance at life and happiness. In a flash he hit the pavement and found himself laying on the side of the road in shock. He had wandered onto the I-10 freeway and been struck by a car. Jackson, a young 8 month old pup, felt excruciating pain set in, and although dazed, he tried desperately to escape the dire situation. But Jackson could not get up. He could only lay stranded, so close to the cars speeding past him. He was terrified and felt helpless! Jackson could only hope that someone might see him and come to his aid. Otherwise, he would surely die. 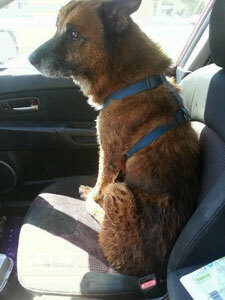 Thankfully, a Luv of Dogz Rescue volunteer spotted him from her car and pulled over. She could tell Jackson was in agony, and it was clear his leg was broken as it dangled loosely from his body. Jackson was so afraid at first, but he finally let his savior pick him up and put him her car. She took him straight to the nearest animal hospital. 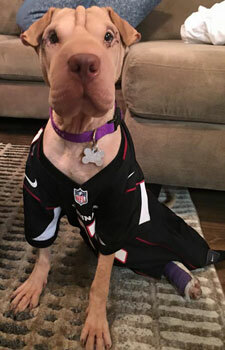 Jackson was treated and helped with the pain, but x-rays revealed he had several complex breaks and would need the expertise of an orthopedic surgeon. It would be costly. Luv of Dogz took Jackson into their rescue and reached out to PACC 911’s Lulu’s Angel Fund who provided assistance for medical costs. 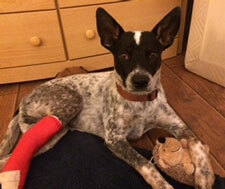 Jackson was taken to the specialist and underwent extensive surgery to repair his leg. Everything went great. Even after surgery, though, he would still need 4-6 months to recover. He had a long road ahead of him. Jackson was placed in a loving foster home to get the attention his body and soul needed to heal. He was safe now, but was out of commission for months, and had been through so much that he started to emotionally shut down. He would hide and avoid people when they tried to comfort him, but his devoted foster family persisted to keep his spirits up. Jackson could feel their love, and in time his confidence grew. He became more and more sociable and his fun personality finally shined through. 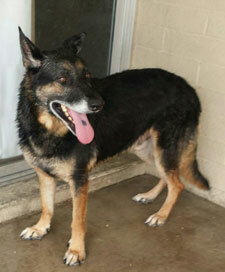 Today, Jackson is an outgoing, and very affectionate guy. The best news is that he has been adopted! Thanks to Luv of Dogz Rescue and PACC 911’s Lulu’s Angel Fund, Jackson will fully recover and live his new life in a safe and loving home. Maxwell is a gentle, loving soul who was abandoned and left to die in his own house. His owner lost his home, and simply locked the door behind him… leaving Maxwell inside. 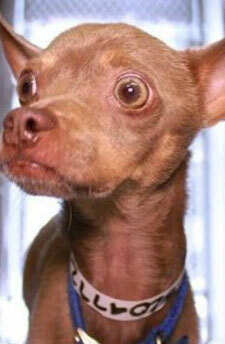 Maxwell was all alone, confused and wondering when his owner would come back…but he never did. A concerned neighbor called Maricopa County Animal Care and Control who was able to remove Maxwell from the home. He now found himself at the shelter, which was frightening, but he would at least have food and water, and maybe… hopefully, a new family would adopt him. Unfortunately, it was determined he had heartworms and Maxwell looked like he might be an older guy, both of which put him at risk. Many times people do not consider adopting an older dog and often do not realize that heartworms is very treatable. Surrendered Souls Rescue and PACC 911’s Lulu’s Angel Fund would save Maxwell! 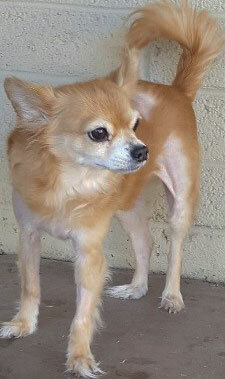 Surrendered Souls took Maxwell into their rescue, and PACC 911’s Lulu’s Angel Funds would assist with medical expenses. After all he had been through, Maxwell was so happy to meet his saviors, showing his appreciation with affection as he drove away from the shelter on his freedom ride. Maxwell was taken to the vet for heartworm treatment and full check up to see if he had endured any injuries while abandoned. Turns out, Maxwell is a young 5-6 year old. He has a few chipped teeth, likely from trying to escape his confinement or find food, but he is a healthy strong boy. 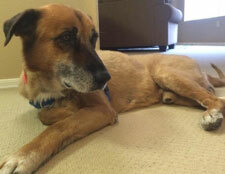 Living in a safe and loving foster home, Maxwell started his heartworm treatments right away. This sweet brave guy is doing great and recovering nicely! Maxwell’s rescuers say he is a joy, and makes those he meets feel joyful too. He will be ready for adoption soon at Surrendered Souls Rescue, so come meet him and feel the love. The cruelty and suffering this one year old toy poodle endured is difficult to imagine. However, thanks to Arizona Poodle Rescue and PACC911’s Lulu’s Angel Fund, little Minnie has gotten the TLC and medical attention she needs and is doing great on her very long journey to recovery. Minnie was staying with a neighbor while her family was on vacation. She was left alone with a child with disabilities. Minnie’s screams were heard, and when the caretakers got to her, both of her front legs were horribly broken and her skull was fractured. Minnie’s family took her to the vet and was going to euthanize her because they could not afford the expensive medical treatment she would need. Although the surgery necessary to repair Minnie’s legs was expensive, this sweet little girl should have a long, loving life ahead of her. 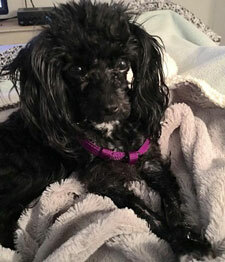 The vet reached out to Arizona Poodle Rescue, and PACC 911’s Lulu’s Angel Fund assisted with medical expenses. Minnie would be saved! Although still shocked by the unbearable pain, Minnie was thankful to all the people around her. She was completely immobile, but she wagged her tail and showed her joy, knowing they had eased her pain and would make it all better. Minnie underwent a very long surgery as plates and pins were needed to repair her badly broken legs. 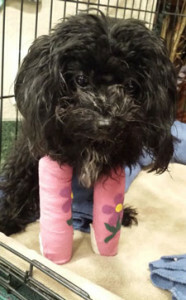 After the surgery, Minnie wore splints to heal, and then got pink casts with flowers on them to help keep her spirits up! Minnie’s loving foster mom took care of her throughout the many long weeks of recovery and rest. Finally, Minnie got her casts off! Now she just has to build her strength up so she can be her spunky self again. Thanks to Arizona Poodle Rescue and PACC911’s Lulu’s Angel Fund, Minnie will soon be available for adoption, and will have a safe, loving home. Listed as a young French Bulldog that had been picked up from the streets by Maricopa County Animal Care & Control, a defeated boy cowered in his crate. He was terrified and exhausted. 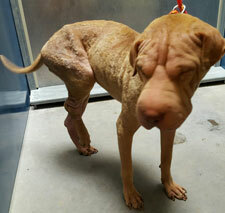 He was covered in painful mange so severe, that his skin was bleeding. 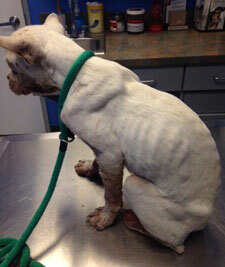 He had ticks all over his body, and he was emaciated. Arizona Boston Terrier Rescue was alerted to this boy’s dire need and came to his aid. When they arrived to save him, he was so scared of the people and other dogs, he had to be carried under a blanket to help ease his fear. He was taken straight to emergency. His rescuers would ease his pain and save his life. They named him Wyatt, after Wyatt Earp. At emergency, Wyatt was unwrapped from the blanket so the severity of his condition could be determined. Surprise! Wyatt was actually a white Boston Terrier mix. He received intravenous pain medication and antibiotics as well as liquids to keep him hydrated. He also got a medicated bath and had all the ticks removed from his body. Feeling comfort and much less afraid, Wyatt was able to go home with his rescuers where he could finally rest, knowing he was safe. Wyatt’s pain was gone, but he had a long road to recovery and more vet visits and medications would be needed. Arizona Boston Terrier Rescue reached out to PACC911’s Lulu’s Angel Fund who provided a grant to help pay for Wyatt’s medical expenses. Over the next six weeks, Wyatt gained weight, his skin healed, and hair grew back. His fear was gone, and he hung out with his foster family and siblings while he recovered. Wyatt felt so happy, and his sweet personality shined through. Once recovered, Wyatt was adopted! Thanks to Arizona Boston Terrier Rescue and PACC 911’s Lulu’s Angel Fund, Wyatt was saved from suffering, found his forever family, and a lifetime of love. He was hungry and thirsty wandering stray in the streets. 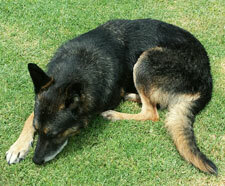 He was as older graying, guy, covered in ticks and wearing a harness that was too snug and rubbing his skin raw. Charlie needed water so bad, and he came to the canal near Southern. He knew it was a reach, but being desperate, he reached out to try to get a cool drink. Suddenly, his foot slipped on the steep slope and he was swimming for his life. He panicked, trying to stay afloat. He could not get a grip on the side to pull himself out and became terrified as he grew so tired. Just as he was giving in, some people came by and reached out trying to save him. The slope made it treacherous. A man laid on the ground while the others held his feet. Charlie and the man reached for each other, and at last, the exhausted Charlie was pulled to safety. He was saved! The nice man put Charlie in his car, and began the search for Charlie’s family. Surely, someone was looking for this wonderfully sweet, old guy. Charlie was taken to the vet to have the ticks removed, and he needed care for his extreme malnourishment. Charlie stayed with a nice lady while they searched far and wide, posting Charlie’s picture and trying to find his family. Sadly, no one came forward. Charlie was homeless. He needed a rescue and to find a forever family. Animal Benefits Club brought Charlie into their rescue and reached out PACC911’s Lulu’s Angel Fund to help with medical expenses. Charlie had been covered in ticks that were removed, but he was still very thin and regaining his strength after being malnourished for so long. Animal Benefits Club got Charlie a full check up and ran tests to determine if he had any illnesses such as tick fever or valley fever. He also had a growth on his side that needed to be checked and removed. Today, Charlie lives at Animal Benefits Club waiting for his forever family. 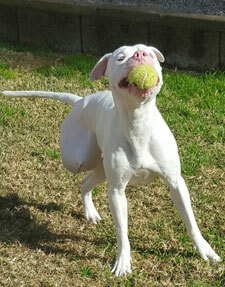 For, now he enjoys playing in the yards with the other dogs and loves everyone he meets. He is one special guy. Thanks to some good Samaritans, Animal Benefits Club, and PACC911’s Lulu’s Angel fund, Charlie is safe and has a second chance for the life of love that this courageous, adoring boy deserves. Chloe, a small, blond, curly haired girl was picked up from the streets by Maricopa County Animal Care and Control in October. Once at the shelter, it was discovered that her belly was covered in mammary tumors. It was unknown how sick Chloe was for sure, but she would definitely need testing, medical treatment, and surgery. Sadly, this meant, little Chloe was put on a 4 day time limit, and would only have a few days to be adopted. She waited each day in her kennel, hopeful… but she was passed over by possible adopters. Her chances at a happy, long, life grew dimmer and dimmer. As is often the case with animals needing medical treatment, no adopters chose Chloe. Her e-day came. This brave, sweet, girl’s time was up. Then, her heroes arrived! Just 34 minutes before her deadline to be euthanized, Surrendered Souls Rescue came and pulled Chloe from her kennel. Her life was saved! Chloe would have a second chance in this world. Surrendered Souls reached out to PACC911’s Lulu’s Angel Fund who gladly provided funds to help pay for her medical bills and surgery. Chloe was immediately seen by her veterinary oncologist, and it was determined that she would need multiple chain mastectomies. Over the next two months, Chloe had two extensive surgeries. With the love and support of Surrendered Souls Rescue, she stayed brave and positive throughout the trying weeks. All tumors were removed, and best of all, all tumors were benign. Chloe will be just fine! Chloe is a beautiful, fun, and loving girl thanks to Surrendered Souls Rescue and PACC911’s Lulu’s Angel Fund, she is all better. Today, Chloe lives in a loving foster home, and is looking forward to finding her forever family. She is still growing her hair back and healing from the stitches, but her beauty shines bright! He waited as MCACC gave time for his family to come and get him. But they never did. He waited, as hopefully, a new family would adopt him. But they didn’t. Gucci was on a short medical timeline, and the waiting was over. He was put on the e-list, and his day came. Lucky for Gucci, Surrendered Souls Rescue was there for him just in time. Surrendered Souls Rescue reached out to PACC911’s Lulu’s Angel Fund and asked for help for his medical expenses who gladly agreed. 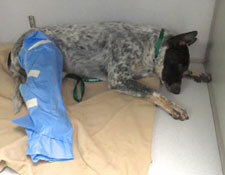 Gucci was immediately seen by a vet and it was determined that his leg needed to be amputated. His surgery went well, and Gucci was champ! He got rest and lots of love at his foster home throughout his recovery. Today, Gucci is good to go. As for the amputation, Gucci says it’s no big thing, and he’s not missing a beat. Gucci is doing great, and this sweet, lovable, guy is ready to go home with a new, forever family. Hero was a gentle soul. He was a beautiful yellow lab with thoughtful brown eyes. Sadly, for no fault of his own, Hero was turned in to Maricopa County Animal Control by the person he loved unconditionally… his owner. Hero did not understand what he had done to be deserted, he was heartbroken and scared, and his health began to deteriorate very quickly. Better Days Rescue came to Hero’s aid. They pulled him from the shelter to get him medical treatment and find him a new family that would love him forever. PACC911’s Lulu’s Angel Fund provided funds to help pay for Hero’s medical expenses. In addition, a family was ready to take Hero into their home and give him the love he so deserved. Hero’s devoted rescuers took him to the hospital for tests and treatment. The diagnosis was devastating. Hero had distemper, and his life could not be saved. His saviors would have to let him go. Hero crossed over comfortably, lying in loving arms, and hearing tender words from Better Days Rescue volunteers and the family that sadly would never get to take him home. Hero’s story is tragic, but because of loving, dedicated people, he crossed over in peace, knowing he was special and loved. Kayla, a beautiful, brindle girl was abandoned and left to die. She was pregnant and had nowhere to go. So, she remained in the filthy mobile home where she was deserted, doing her best to stay alive and save her puppies. Luckily, rescuers learned of Kayla and came to her aid. These caring protectors would save Kayla’s life and her babies. When rescuers arrived, they found piles of trash and debris, and the home was filled with sewer roaches. Kayla had given birth to the puppies and they were all covered in the refuse. 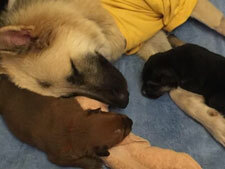 Rescuers carefully dug through the filth and lifted Kayla and her puppies to safety. The family was immediately taken to the hospital for exams and treatment. Animal Benefits Club of AZ took the family into their rescue and PACC911’s Lulu’s Angel Fund stepped in to assist with medical funds. With medical care, Kayla and her babies would all be okay… except for one puppy, beautiful little Breezie. She was barely alive when rescued, severely dehydrated, and was just one fourth the size of her siblings. Emergency veterinarians concluded that she could not control her own body temperature, making her too weak to nurse from her mother. One of the dedicated Animal Benefits Club caregivers took Breezie in and syringe fed her every two hours, keeping her warm on a heating pad. Breezie grew stronger, and she would survive to be a healthy girl too! This wonderful family was saved! Thanks to the actions of rescuers, Animal Benefits Club of AZ, and PACC911’s Lulu’s Angel Fund, this gentle momma and pups are happy and healthy, and ready to find loving, forever homes. Kojak sat in a kennel at Maricopa County Animal Care and Control. He was bone thin from barely surviving on the streets and ached from a severe case of mange. 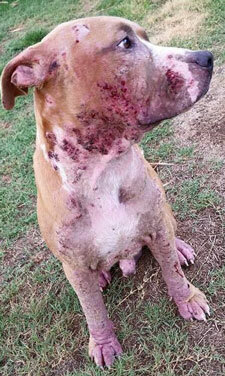 His skin was raw from the mange, and he was actually bleeding from the scabs that covered his body from head to toe. In fact he could barely walk on his swollen feet. Kojak had been saved from the streets and finally had food and water, but his life was still on the line. 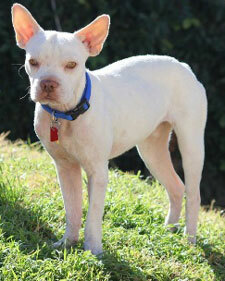 Kojak’s only hope to survive was to be picked by a family to take him home. As possible adopters walked past his kennel, they saw an emaciated pit bull covered in scabs. Really, what were his chances? To make things worse, his mange was so bad that he was put on a medical time limit, narrowing his possibility for survival even more. His days passed, and Kojak was put in the e-list. But not for Kojak! In stepped his saviors at 2nd Chance Dog Rescue! They saw this guy and pulled him from suffering, taking him straight to the vet for medical treatment. PACC911’s Lulu’s Angel Fund provided funds to help pay his medical bills. Kojak was saved! After a couple of months of treatment, Kojak is all better and feeling great. He loves his new life, and finally has the comforts and love he deserves. Turns out he is a fun-loving, cool guy, and so thankful to the people who saved his life. Kojak is beautiful, sweet, boy and is so ready to find his forever family! How long did she suffer? We don’t know, but Miya was turned in to Maricopa Animal Care and Control in August with a broken leg and balding skin. At first, it seemed she had been hit by a car, but sadly, when Miya was examined by doctors, it was clear she was abused, and her leg had been broken by a cruel human. Miya, just over a year old, had known pain, misery, and neglect for quite some time, if not her whole life. Now, she found herself homeless and in urgent need of medical treatment. Would this little soul ever feel loved, or would her short life simply end with a final heartbreak? Happily, Miya would know love, so much love! Pei People Shar Pei Rescue and PACC911’s Lulu’s Angel fund would save her! Pei People Shar Pei Rescue took Miya into their care and PACC911’s Lulu’s Angel fund helped with medical expenses. The healing of body, mind, and heart began immediately. Upon further examination it was found that Miya’s leg needed surgery and a plate to repair the damage. She also, had an untreated genetic condition called entropion in which an eyelid grows inward causing constant pain and discomfort. Miya’s severe hair loss was due to malnutrition and stress. This poor, sweet girl had endured so much. Miya was finally safe, though, and she had surgery to repair her leg as well as the entropion. The procedures were successful and just a few weeks later, Miya was getting around perfectly and her eye was pain free for the first time too. A nutritious diet and lots of love took care of her balding skin, and her beautiful coat grew back in. Today, Miya has a joyful heart and knows she is loved and valued. Her sweet, gentle personality shines through, and after all she has been through, Miya loves everyone she meets. 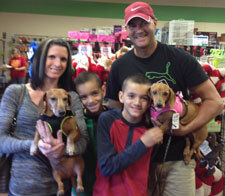 Best of all, Miya was adopted to her forever family and has a new brother Shaymus! Thanks to Pei People Shar Pei Rescue, PACC911’s Lulu’s Angel fund and a wonderful loving family, Miya will have the safe and happy life she deserves.! Prince had a family. He was completely dependent on them for everything. One day, his family put him in the car, but instead of going to the park for a walk, or a joy ride to hang his head out of the window, his family took him to Maricopa County Animal Care and Control and left him. Prince was emaciated, and in very poor health when he was left at MCACC. He was terrified. He wanted to understand what was happening, but just felt so weak and sick. After a short period on medical deadline, Prince was put on the e-list. It was his last day, and Prince’s time was up at 5:30 that evening. Sadly, Prince would leave this earth and likely have never known the feeling of heartfelt love. Just hours before his death, Surrendered Souls Rescue pulled him from MCACC, saving him from euthanasia. Surrendered Souls knew Prince would need substantial medical care, and they reached out to PACC911’s Lulu’s Angel Fund who gladly provided assistance with expenses. Prince was so thin and was taken to the vet for testing and treatment. Tests revealed Prince had both Tick Fever and Valley Fever. Over the next few months with good nourishment and ongoing medical care, Prince overcame the Tick Fever. He is making great progress towards recovery from the Valley Fever. With the love and commitment of his saviors, Prince is a brave and determined little guy. Today, Prince is getting the love and pampering he deserves in his foster home. 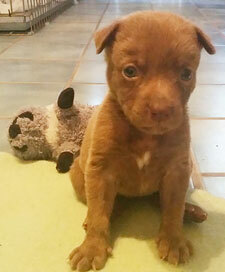 He enjoys playing with his foster siblings, and gets stronger each day. Thanks to Surrendered Souls Rescue and PACC911’s Lulu’s Angel fund, Prince is getting a second chance and looking forward to meeting a new family who will love him forever. Did she escape a lifetime of caged confinement? 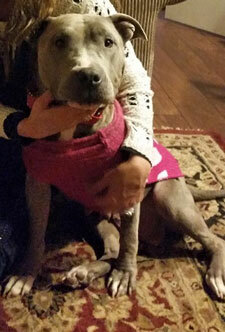 We will never know for sure, but sadly, that is likely the case for this warm, loving, two-year old pittie. What we do know is that Raleigh courageously saved herself, dragging her own body across a field and to a busy street seeking help. She was emaciated and could not use her back legs at all. A good Samaritan saw her and stopped, picking her up in her arms, placing her in the car, and taking Raleigh straight to a hospital. It seemed that Raleigh had been hit by a car, but x-rays revealed it was more likely she had been confined in a small space and malnourished to the point that she had no bone mass making her unable to walk. It was also determined that Raleigh had given birth to puppies only a few weeks before. 2nd Chance Dog Rescue was contacted and took this wonderful girl in. PACC911’s Lulu’s Angel Fund assisted with medical expenses. Even though Raleigh had most certainly suffered at the hands of a cruel human, she was all wags and kisses for her rescuers and everyone she met through her tests and exams with the vet. Unfortunately, after searching the area, her puppies were not found, but Raleigh was finally safe. Raleigh received treatment and was ready for recuperation and love. A wonderful foster stepped up and gladly took this delightful girl into her home, so she could begin to heal and regain strength. Raleigh is full of joy and so happy to be alive. She gets along with other dogs and is extremely loving, happy, and sweet. Thanks to a good Samaritan, 2nd Chance Dog Rescue, and PACC911’s Lulu’s Angel fund, and a devoted foster family, Raleigh is ready for the life she deserves with one lucky forever family. We don’t know much about this girl’s past, but she ended up at Maricopa County Animal Care and Control in late September. 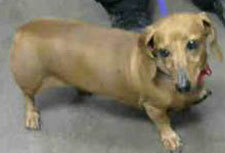 This sweet Dachshund was covered in ticks, had tumors on her body, and had a dark growth on her foot. Knowing she would need medical treatment to increase her chances for adoption, Happy Tails Dachshund Rescue took her in and named her Sweetie. The rescue reached out to PACC911’s Lulu’s Angel Fund to assist with medical bills, as Sweetie would need surgery to remove her tumors. The next few days, Sweetie visited the vet for testing and to determine next steps. Yes, she would need surgery to remove the tumors and also needed some dental work done. Sweetie’s surgery went great, and she even got pink stitches so she would feel pretty while she healed! Sweetie spent the next few weeks, recovering in her foster home. She got to know all her foster siblings and enjoyed spending time with them. She also bonded with her foster mom following her around the house for extra exercise. All healed up, Sweetie did not have to wait long to find her forever home and was adopted in December. Thanks to Happy Tails Dachshund Rescue and PACC911’s Lulu’s Angel Fund Sweetie has a new family with dad, mom, two human brothers, and a dog brother, Topaz who gave her a kiss on first greet. Have a happy life Sweetie! Stormy was just a baby, not even a year old herself. Now, this baby was a momma… a momma without a home. It was one of the worst monsoon storms of the season. Wedged among equipment at a construction site, surrounded by crashing lightening and pouring rain, Stormy gave birth to six puppies. When workers came the next day, they found Stormy and her pups squeezed in the small space. 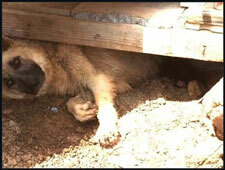 They tried to keep her comfortable in the 104 degree heat and reached out to Saving Paws Rescue to help the family. Saving Paws came right away, and when they arrived, realized removing the family would be difficult. Stormy and pups would have to coaxed from her make-shift den. 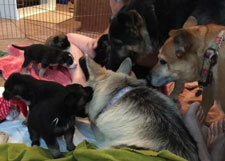 Stormy and puppies were taken to safety and cared for by Saving Paws Rescue. Sadly as the next few days unfolded, Stormy’s critical health issues were discovered, and it was heartbreaking. Stormy was emaciated, and she had been eating rocks, because that was all she could find. She had been starving and now struggled to provide milk for her babies. In addition, Stormy continued to bleed long after her uterus should have contracted. Stormy was rushed to the vet. Her condition was even worse than anticipated. Stormy was anemic, and she needed surgery. To complicate her condition, Stormy had advanced heartworm disease. Stormy needed life-saving surgery, but with her weakened condition, surgery was a risk. Stormy was given a 25% survival rate. The situation was dire, but Stormy’s eyes let her rescuers know she wasn’t giving up, and her rescuers would not give up her either. Saving Paws made the commitment to save Stormy no matter what her chances. They reached out to PACC911’s Lulu’s Angel Fund for assistance who would help with medical bills. The fight for Stormy’s life was on. The next few months were extremely trying as Stormy survived the surgery but had complications due to her diminished immune system. Stormy stayed determined, and she lived. The battle for her life continued as after months of critical recovery, she had to endure even more serious heartworm treatment. Stormy felt the devotion and love of the people around her, and she knew her babies needed both them, and her, to survive. Throughout her struggle, Stormy remained committed to her pups. She made a wonderful mother loving, cuddling, and teaching them throughout her recovery. She was also thankful to the people helping her, and she trusted that handling and bottle feeding her babies would save their lives. 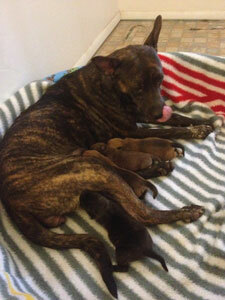 She even let the other foster dogs with motherly instincts nuzzle and socialize her pups when she needed rest. Today, several months later, Stormy’s babies have all found homes with loving families. Stormy is still getting final treatments for heartworms but gets stronger each day. She now lives in comfort and can soon run and play like the puppy she still is. Stormy is a gentle soul and shares her light with everyone she meets. She is a true inspiration to us all reminding us to be committed to ones we love, trust those who love us, and know that with heart and determination we can overcome the odds.